With the cold weather of winter starting to die down, it’s time to think about spring and all of the possibilities that come with it. While the flowers begin to bloom and the grass turns green again, it’s also the time of year where pests start to show back up. 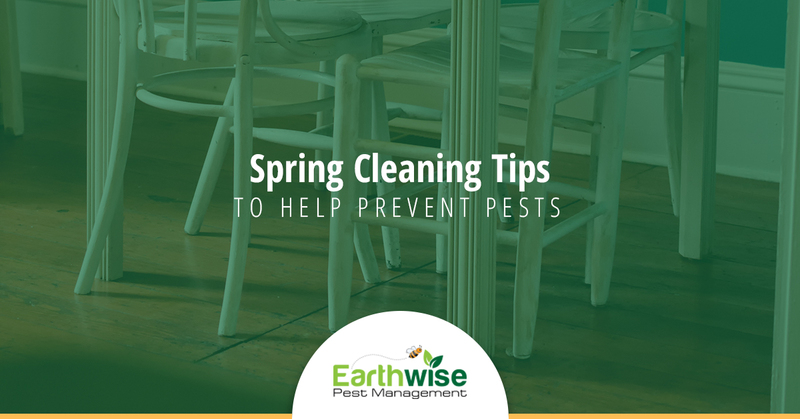 The good news is, the spring cleaning that you do can help reduce the chances of you coming across pests this spring. If you’re about to get started with your spring cleaning, today’s blog is for you! We’re going to touch on a few spring cleaning tips that will help keep pests away throughout the spring. Keep reading to make sure that you’ve got all your bases covered before you start cleaning. The kitchen is the heart of the home, but it’s also a room where pests can find food sources, standing water, and a dark place to hide. Ants, cockroaches, beetles, and moths are common pests that are known for finding a home in the kitchen. Usually, it is the food that draws them to this room in the first place. That being said, your pantry and cabinets that store food should be a priority in your spring cleaning. As you clean up the storage spaces that harbor food, throw out any food that is stale or dated. These are the types of food sources that attract pests and provide them with an easily accessible food source. While you’re in there, you should wipe down the cabinets to ensure there’s no residue from foods that might lead them to their next meal. It’s not uncommon for sticky fingers and crumbs to lay out in these spaces. Lastly, go ahead and give your kitchen the storage upgrade it needs. Make sure that you have adequate storage for foods that will remain open so that there’s no way for pests to find their way into them. A few good examples of this are baking ingredients like flour and sugar. Investing in storage containers that protect these foods and keep pests out is well worth the money you’ll spend. Depending on your home, you may have a finished, partially finished, or unfinished, basement. Regardless, this is another space that you need to be wary of when it comes to pests. Now, depending on what your basement looks like and the purpose that it serves, your spring cleaning could look very different. For most of us, however, our basement serves as an extra storage space — which is also often what makes it an ideal space for pests. Pests like mice, spiders, roaches and the like can find a safe haven in a cluttered basement, which is precisely why it should be a priority of yours when talking about spring cleaning. Though it may take a little bit longer to clean up a space as large as a basement, it’s strongly recommended. Go through boxes, organize the layout, and declutter when possible. Movement is a great way to ensure that pests don’t find an undisturbed part of your home, but it’s also a great way to keep from building a collection of clutter. That’s a win-win for spring cleaning! Sitting water is guaranteed to attract pests. It’s one of the biggest things that we look for when it comes to infestations, and it happens all the time in bathrooms. The same way that your kitchen makes finding a food source easy for pests, your bathroom provides them with water and, more often than not, a dark place to hide. Take a second and think to yourself. When was the last time that you looked under your bathroom sink? If it’s been a while or you’re scared of the clutter build up that you have happening under there, then it’s crucial that you add your bathroom to your spring cleaning list. The cabinets below your sink could be hiding some unwanted house guests, and who knows for how long! Spring cleaning is a must. Not only is it a great way to start this season of growth, but it’s a great way to ensure that pests don’t find a home in your house as they begin to show up again. All in all, we hope that you’ve found some value in the pointers that we’ve included in today’s blog and that you have a new perspective to your spring cleaning and the benefits of doing so. If you come across a pest infestation while cleaning, Earthwise Pest Management is the company to call. We can help remove the pests that you’re struggling with and provide you with a safe treatment and long-term solution. Start the year off right by getting your home in tip-top condition and taking care of any pest control problems right off the bat. Reach out to us, and a member of our team will be more than happy to help.